Today’s primary task was to check whether we needed to make a reservation for our upcoming visit to Yellow Bench, a Polish place we’ve been keen to visit, for a while. With that task duly completed, I turned my attention to lunch, travelling all the way next door, to try Gaia, a quirky little Italian deli. Full of tempting looking produce, particularly some fine looking ham and sausage, the welcome at Gaia is typically Italian. All the staff members are delighted to see you, and go out of their way to make you feel at home. The feeling of home is further augmented by their homely dishes, full of comfort and warmth. A further level of home was evoked in their choice of soup bowl, which happened to be the ones I use in my abode, for lunchtime soups. 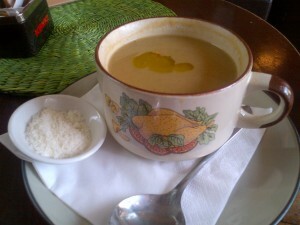 Filling my bowl today was a rustic cauliflower soup, which was rather good. It wasn’t the most elegant dish in history, and the accompanying parmesan didn’t work nearly as well as a blue or strongly mature cheese would have, but I was happy with its abundant and strong cauliflower flavour. 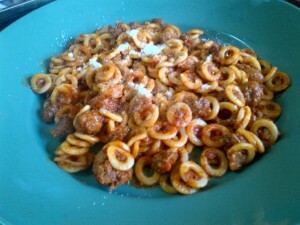 I opted to follow this with one of their pasta specials, which today was hoopy pasta served in a meaty ragout. This was a nicely executed dish, full of flavour, but very much something that I imagine you’d be comfortable with producing by your own fair hand. Their paninis looked large and impressive, and seemed to be very popular with the steady stream of trade, most of which seemed to be comprised of regulars, which passed through the place, as I lunched. So overall, I was quite charmed by Gaia. The quirky café surroundings are matched by a soundtrack of Italian classics, and an abundantly warm welcome. Dishes are good examples of tasty, filling, and warmly satisfying Italian home cooking. 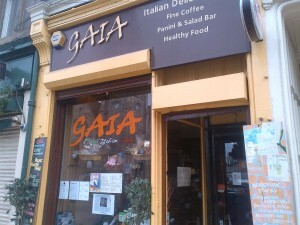 Next time this is what you’re needing, I’d happily recommend you head to Gaia.